After working in retail management for 12 years, Abby Fortis decided she had the skills and experience to go out on her own. She opened her boutique Inle Home in the seaside town of Rottingdean, and hasn't looked back since. 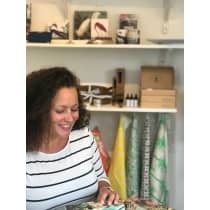 This small but mighty shop is filled with carefully chosen gifts, homewares and clothing, all of which are as charming and distinctive as the shop space itself. "I take pride in visual merchandising and often get comments about how lovely the shop looks...it also helps that the tiny building is very quirky and full of character!"